The big plans for Christmas this year were a long weekend in Hong Kong, since Christmas falls on a Friday and Gary, W and Eric were going to be there from LA. To top it off, Aaron was going to be there, too, and Angel as well. What a perfect time to meet up with everyone. Sadly, it won’t be happening. Tawn’s managing director decided that no more unpaid leave would be approved for the rest of the year. It seems that twelve paid vacation days a year aren’t enough for Tawn, considering that we burned through those in the first six months of the calendar. So we had to squash plans for our Hong Kong trip, postponing it until April. The upside is that our friend and former roommate Stephanie is in town from Melbourne and had we gone to Hong Kong, we would have had to leave her to her own devices for a long weekend. Now we’ll be able to enjoy spending time with her through her entire holiday here in the Land of Smiles. 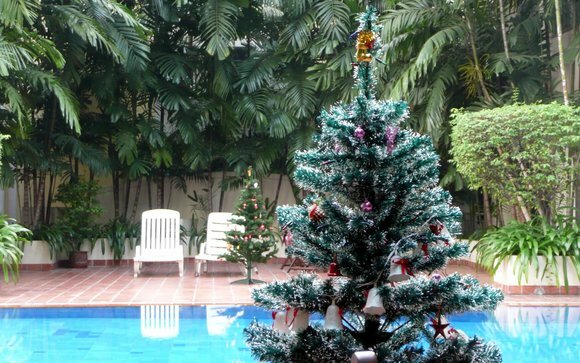 Rather oddly, the maintenance people here at the condo erected two Christmas trees on either side of the swimming pool, extension cords for the lights taped down along the terra cotta tiles. It is very pretty just after sunset when the lights are on. 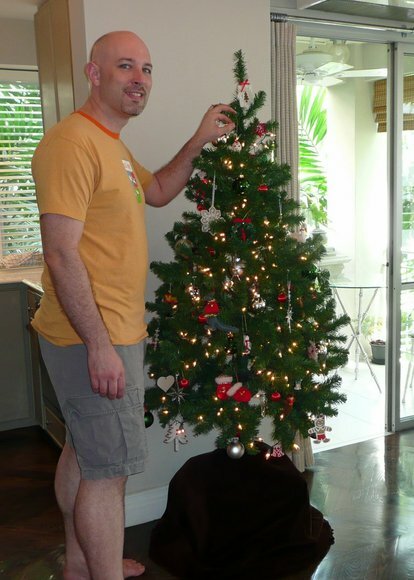 We’ve set up our own Christmas tree, too, something we do some years and not others. It is an artificial tree, of course, and one that I think looks particularly artificial. In fact, there is a point where the whole thing becomes a bit of a caricature of the holiday tradition since neither Tawn nor I really celebrate Christmas. I think we put the tree up some years more as a decorative item than anything else. The plan is to call the nieces on Christmas Eve their time and report that, since Thailand is some 13 hours ahead of Kansas City, Santa has already arrived here and has said that he is heading their way. Let’s keep that childhood innocence alive as long as possible. This entry was posted in Uncategorized and tagged Christmas, hong kong, travel by christao408. Bookmark the permalink. Aw bummer about Hong Kong. I love that place! At least you’re still planning to go in April, which isn’t too far off. Too bad about HK…that would’ve been so fun but it is also nice to stay home for the holidays. Awww too bad you and Tawn couldn’t go to HK and meet up with Gary and W and Aaron. I would be sad too. But I am glad you will be seeing Stepahnie. Have a very merry Christmas, or holiday, or whatever you want to celebrate. We don’t either, but we will get together with my daughter’s family and another couple on Friday and just chill out. Well, at least HK is happening in April! Happy Holidays Chris. too bad…I am actually packing my bags to HKG while reading this…anyway Happy Holiday… and hope will meet up with you guys soon…maybe in BKK as well? @agmhkg – You are always welcome in the Big Mango. Safe travels. @Dezinerdreams – @Roadlesstaken – Yes, and it will be a bit cooler than Bangkok at that time. @ZSA_MD – Enjoy the holidays. @brooklyn2028 – It would have been but there’s no place like home for the holidays. The question is, where is home these days? Hmmm…. Too bad about the vacation plans. There is at least a silver lining! So sweet to want to keep the magic alive for the neices. What softies – when they finally discover the truth you’ll probably be the one most disappointed. hehehe. I’m so glad that you have put up a tree this year! I recognize some of those ornaments! Merry Christmas! Very nice of you for the Santa call!And yeah too bad HK plan didn’t work out but have fun with formerroomie! That’s so cool (and very cute) that you are going to call your nieces.I have to ask you, is it hard or different to spend Christmas in a tropical place like Thailand? Have ffun in thailand then! It’d be so fun to go to HK, so at least y’all get to go early next year! Geez, what a douche of an employer! You’d think he worked in the U.S.! Have a Merry Christmas anyway. @CareyGLY – Well, in some fairness to his boss, employees have been abusing the pay without leave policy. Unfortunately, Tawn was just caught up in a crackdown to impose some consistency. @secade – True. We’ll always have Hong Kong…@Wangium – Strange but true. @TheCheshireGrins – Well, I grew up in the SF Bay Area so I’m not used to a white Christmas anyhow, but it is definitely a little odd to be experiencing “chilly” temps in the high 70s during the holiday season. @yang1815 – I have to figure out how record that call. @arenadi – It is a nice place to spend the holidays. Decorated, vibrant, cool weather but not cold. Good food and shopping. @oldpartner – Yep, almost all the ornaments are from childhood, many of which were made by Grandma and Grandpa. @murisopsis – That’s the truth. The real fun is for the adults. I think the children figure it out much earlier but keep up the ruse just for the benefit of their parents. @christao408 – Call with Skype and record on the comp? @yang1815 – I’ve tried and it doesn’t seem to record both channels of audio equally. Only picks up my voice clearly. @christao408 – Hmmm… There has got to be a way. How about just a recorder by your then? Or another laptop to record it digitally. Haha~there’s always the next Christmas! Maybe we can all meet up in the Big Mango! I love watching the fireworks during Loy Krathong. @CurryPuffy – That would be fun. Loy Krathong is a great time for a visit. How the heck did I miss this post? I thought I commented? It’s too bad Tawn wasn’t able to get time off. But April is just around the corner. I can’t wait for your HKG video blogs. @ElusiveWords – Sometimes the posts slip by us. Yes, April isn’t that far away, but there will be plenty to blog about before then. It looks like there may be another US trip this summer, possibly July. Am considering a stop in Toronto if that becomes the case.